The latest numbers look something like this: 20-25% of all emails are opened on a mobile device. I was when I first saw it, but it makes sense. Smartphone adoption has spread rapidly. Today, more people have smartphones than broadband internet access. 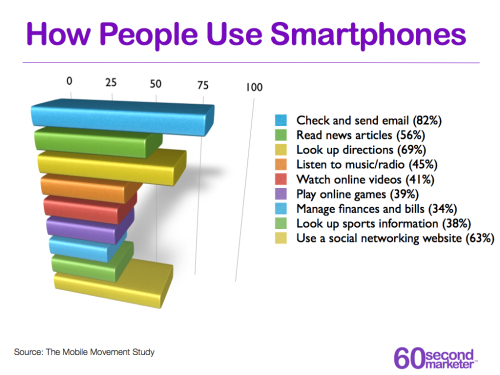 And email is at the top of the list of things shifting more and more exclusively to mobile devices. So what does that mean for your email marketing? It means that every email you send out is a mobile email. No more customizing for mobile on certain messages. Every single one needs to be built and optimized for mobile viewing. It gives your message the best possible chance of being read by the highest number of subscribers. Which brings us to the topic at hand, readability in mobile emails. When I open up your email on my phone, it’s a much different experience than opening it on a desktop. It’s smaller. And while I am holding it up in front of my face, often times I still can’t read the text. Then when I use my fingers to zoom, I have to scroll back and forth to read each line. We can fix that. Use larger text. Use graphics. Use multiple columns for easy zooming. If it’s that much work to read your email, I won’t. And neither will the other 20% of people that open it up on their phones. Sounds like you might be fighting a losing battle to me.